There are seven species of Vinca that are collectively known as Periwinkles, but in a prime example of why we should use their botanical names, the annual plant Catharanthus roseus is also commonly known as a Vinca and even occasionally as a Periwinkle. Vinca major, the Big or Greater Periwinkle is hardy in USDA zones 7-10. Big Periwinkles can grow up to about 1-1½ ft. tall and spreads by long trailing stems that root along the ground as they grow. They produce purplish-blue 2" flowers from spring through fall. The foliage of V. major 'Variegata' has creamy white blotches and margins. V. major 'Maculata' has leaves with yellowish centers. Vinca minor, known as Dwarf Periwinkle or Myrtle, are hardy in USDA zones 4-9 and is a nearly perfect miniature copy of V.major. Myrtle is a spreading sub-shrub that grows 4"-6" tall and can form a dense mat up to 10 ft. wide. They produce lavender-blue, ¾"-1" flowers from mid-spring until early summer. V. minor 'Alba' has 1¼" white flowers and lightly variegated foliage. Both Vinca major and Vinca minor are well adapted to growing in hanging baskets or other planters. Big Periwinkles can be grown in full sun, with plenty of water if your main concern is having lots of flowers, but is better grown as a ground cover in partial shade. Dwarf Periwinkle should only be grown in partial or full shade with a little morning sun. Perennial Vincas thrive in almost any soil, as long as it is well-drained. For the best results however, compost or other organic material should be mixed into the soil at planting time. Periwinkles are fairly drought tolerant once they are established but grow and bloom best with regular watering. 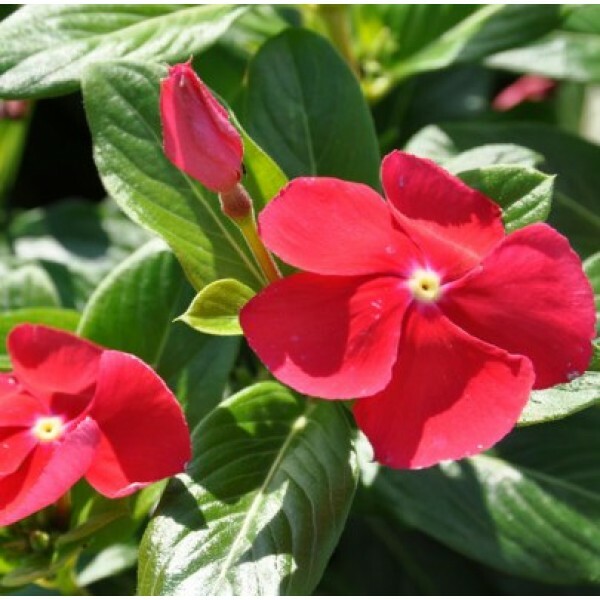 Vincas should be fed every two months while they are actively growing, using a good all-purpose fertilizer applied according to label directions. Shear Periwinkle plants back hard in the spring to promote fresh, new growth and to control spread.